Good lighting is a profitable investment. Using our lighting technology both electrical consumption and maintenance is reduced. We have a wide range of professional solutions. Lighting in industrial environments has an important function and has a clear connection to health and safety and quality. A lighting installation must optimally contribute to good vision performance and give high levels of physiological support for alertness and concentration, thereby contributing to a safer workplace. The lighting quality must emphasise the natural structure and colours of the material to allow maximally qualitative work and a fault free end product. Energy efficient technology is an obvious choice for us. Prismalence lens systems and multiple lens variants create conditions for lighting large areas with low power. We have several examples of how effective and energy efficient our armatures can be in combination with masts mounted at varying heights. The picture above is from Southampton Container Terminal in UK, which was our first port installation. There we replaced the original 3x1000W HPS fittings per hi-mast, with 6x 250W CDM Booster fittings (later on 6x 210W Stella fittings) giving more than 50% energy savings and a payback time of approx. 5 years, for replacement of working 1000W or less than 2 years for new installation or replacment of broken lights. Illumination of buildings, monuments or objects is intended to emphasise, embellish or change. The thinking behind the lighting is the most important thing to establish before starting a project. We help to design pleasant lighting that is both energy efficient and creates the desired result. Creating a sports facility with a good environment, clear visibility and a low energy level, requires illumination of the highest quality. With a lighting installation with a high colour rendering factor and a high light exchange with neutral white light, the energy levels are reduced in comparison with previous technology. 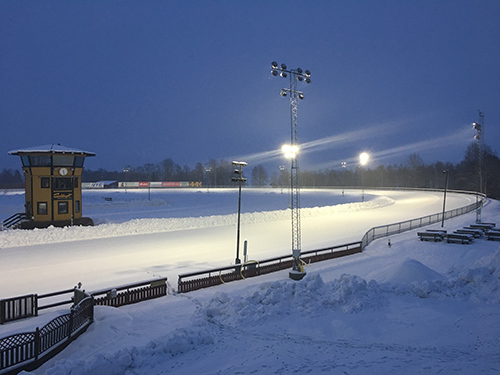 Prismalence lights skiing facilities, football pitches, cross country skiing tracks, shooting ranges, ice-hockey rinks, sports halls. Now also horse racing tracks, the picture above is from the first all LED horse racing in Sweden. Lighting in parks and squares must be pleasant and attractive, create atmosphere and safety. Parks and public spaces must be safe and secure places to go. The light provided must give good visibility and allow good facial recognition of oncoming people, to give a clear image of who and what one is meeting. Light levels do not necessarily need to be high but the colour rendering of the lighting must be very good.